Below is an extract from book by Jane Jacobs, The Death and Life of Great American Cities. It talks about how superficial or rather visual understanding of slums that leads to conventional planning to clear them out as a blight blot ignoring the tremendous energy they contribute in regenerating itself and in effect encapsulating more energy and ambition as a driving force. This is no romanticizing of slums, rather a deeper look at forces that causes them to exist and why they can be a source to less expensive, informal, vibrant with entrepreneur spirit caused due to drive and energy. Our present urban renewal laws are an attempt to break this particular linkage in the vicious circles by forthrightly wiping away slums and their populations, and replacing them with projects intended to produce higher tax yields, or to lure back easier populations with less expensive public requirements. The method fails. At best, it merely shifts slums from here to there, adding its own tincture of extra hardship and disruption. At worst, it destroys neighborhoods where constructive and improving communities exist and where the situation calls for encouragement rather than destruction. Like Fight Blight and Conservation campaigns in neighborhoods declining into slums, slum shifting fails because it tries to overcome causes of trouble by diddling with symptoms. Conventional planning approaches to slums and slum dwellers are thoroughly paternalistic. The trouble with paternalists is that they want to make impossibly profound changes, and they choose impossibly superficial means for doing so. To overcome slums, we must regard slum dwellers as people capable of understanding and acting upon their self interests, which they certainly are. We need to discern, respect and build upon the forces for regeneration that exist in slums themselves and that demonstrably work in real cities. This is far from trying to patronize people into better life, and it is far from what is done today. The edited version of this interview first appeared on World Architecture News, here. Complete conversation is presented below. Q. Given your multiply rooted identity, you have a far more nuanced understanding of the East-West dialog on Cities that we are currently seeing taking shape. Do you think there is a much larger theme that is unfolding in urbanization than merely the geographic tirade that we tend to witness? The ongoing East-West dialog on cities is part of a much larger theme that is trying to make sense of the bewildering global scene unfolding in front of us. It is a theme that has intricate ties with complex economics, communication and foreign policy, all of which is forcing nations, cities and communities across the world to reconsider their priorities. Urbanization is part of that. As Robert Kaplan points out in his book “Monsoon,” it is part of the shifting geopolitical focus of the now-departed twentieth century, where the Western Hemisphere lay front and center. This shift is focusing strong attention on what cities in Asia, South-America etc. mean – not out of casual curiosity as has happened before, but out of sheer need and hope. This is an unprecedented theme, wherein Western architects and urbanists looking for work abroad will have to recognize that the work they have done and continue to do at home – good, bad or ugly – has in some ways always been connected to that abroad, because cities abroad have always looked to the West for answers even though they may deny it. In turn native urbanists abroad will now have to rethink what their cities really mean, and reconsider how to engage with them. In some ways all three of my books spark off from the urgency within this discourse. Q. Tell us a little bit about your three books and motivation behind each of them. My forthcoming book “Zen Spaces & Neon Places” brings two decades of writing and reflecting on Japan, since my first trip in 1993 as an exchange student from India. With the emergence of China and India, Japan has now dropped below the intellectual radar, when, in fact, it continues to remain a very relevant reference for our times. So this book offers a critical reinterpretation of Japan’s complex built environment across history – the import of Tang Dynasty prototypes, entry of European influences, insinuation of Western democracy, rise and collapse of the economic bubble, the Fukushima Daiichi nuclear disaster – and their transformative effects in shaping and re-shaping the Japanese built landscape we see today. The intention is to provoke deeper reflections on why and how what we see today has come to be, and learn from it. The “Emerging Asian City” was born out of a frustration: There are a lot of books with the title “Asian Cities”, but they are really focused on select regions of Asia- south-east, middle-east etc – missing the larger point. So this book brought together multi-national, multi-disciplinary scholars who were doing great work on different parts of Asia, to capture – however imperfectly – the sheer breadth and complexity of the various forces shaping cities across Asia today. This book is an argument to notice how regions across Asia, despite their differences, also have numerous overlaps – thereby offering another reading of where Asian cities are heading. “Rediscovering the Hindu Temple” makes the point that the Hindu temple today is a lot more than just a historic, classical, sacred artifact. In this book, we explore the controversies behind the treatises that have shaped them, and also examine their traditional architectural canons. But more importantly we look into several other dimensions of temples that are typically missed – such as their rudimentary and populist forms as wayside shrines, their presence as larger habitats, or ritualscapes devoted to prescribed and choreographed activity. We simultaneously notice them as contemporary elements, having a profound influence on the Indian metropolitan landscape. So this book provokes a dialog on the nexus and potential of religion and other populist forces as agents and catalysts for urban transformation in India and beyond. Q. Through your books, specifically, The Emerging Asian City, did you encounter some deeper understanding while curating and writing the series which you had missed earlier? I think the deeper understanding that emerged from this book was where exactly different Asian cities overlap and separate – and why. The Indian sub-continent, for instance, is historically entwined with the cultures of the Persian and Gulf region through the Islamic trajectory, as it is with China and Japan through the Buddhist one. Colonialism; post-independence Nation-building; the entry and assimilation of Western democracy; informal urbanisms; sudden cities; the embrace of Modernism – these are phenomena scattered throughout urban Asia in space and time, even though their specific guises may be different. We all know how several Asian nations, after independence, built brand new Modern cities as emblems of sovereignty. But six decades later, how and why are Chandigarh, Islamabad, Jakarta and Tehran different? Rapid urbanization has been a cyclical phenomenon in Asia – Japan in the 70s, Hong Kong in the 80s, Kuala Lumpur in the 90’s and now Shenzhen. The forces shaping different Asian cities have been different but neither are they necessarily isolated nor regionally unique. This may seem like a pretty obvious point, but very few books have really sunk their teeth into what exactly this means. Q. How does this understanding reflect on your practice as an urban designer while working on projects in different regions? Where does it intersect, amalgamate and differentiate in actual design solutions and implementation? Does this make it easier or challenging given the complexities of urban fabric and issues? Most of my recent professional work outside the United States – mainly the United Arab Emirates, Panama, Mauritius, Kenya and China – has been for private developers or municipalities. In other words, it has been in the mainstream layers of city making – in that, I am not dealing with impoverished or alternative contexts, or conversely iconic high-budget creations. In this middle layer, the general ideas we promote in the US – pedestrian-friendly streets, compact development, multi-modality, dignified density etc. – are relevant globally, because sprawl is a global phenomenon. The specifics of sprawl, however, both in form and the processes and expectations that generate it, are different across the world. So the challenge of working abroad in this respect has been one of negotiating where to introduce progressive urbanism ideas from the US authoritatively, where not to, and where and how to adapt them. For instance in China, if you want to make a neighborhood with small blocks and therefore more streets, many of these streets have to be private and contained within gated mega-blocks. And ultimately how to penetrate the administrative structures of a city and influence and transform planning regulation from being sprawl-driven to something else remains at the heart of all such efforts. But I like to think that I am also engaged in another form of practice – and that is research with my students and academic colleagues. This is where I get to engage with issues beyond mainstream city-making. And this is where I get to test many of the ideas I write about. We have an ongoing research project to chart multi-disciplinary strategies for the future of Banaras, one of India’s oldest sacred cities. I have a grant to do an incremental enhancement plan for the surroundings of the Ise Jingu, one of Japan’s oldest Shinto shrines. We have been studying how to reuse and resurrect the ancient Qanats (subterranean water channels) of Yazd, Iran. I think all these are forms of practice – in that we are engaged in urban change and intervention, whether it is a developer project, or a hypothetical proposition. Q. Do you see the flattening of cultural differences and the slow disintegration of diversity under the rubric of globalization as a challenge or a fertile phenomenon that may give emergence to something more interesting in Cities of tomorrow? I think it is both. The flattening of cultural differences began with modernization, but could not surpass the deep-rooted cultural blueprints of many non-Western cultures. In the Emerging Asian Cities book there are several chapters that show how cultural blueprints endure. They end up becoming commodities for tourism and entertainment – as Kasama Polakit points out in her chapter on the Bang villages of Thailand. They can in fact be reinforced and renewed through successive external transformations, as Robert Cowherd observes in his piece on Surakarta. Jeff Hou examines the juxtaposition of what he calls “vertical urbanism, horizontal urbanity” – in Tokyo, Hong Kong, Taipei etc – where shimmering high-rises rub shoulders with a tradition of informal markets. Vic Liptak follows three generations of a native family in Aksaray, Turkey as they renounce their traditional homes and move to new apartments, and seamlessly appropriate it with indigenous spatial patterns. Even cities like Chandigarh, as I argue in one of the chapters that were built from scratch as new utopias have been seamlessly appropriated by a native ethos. In other words, if we learn to see globalization as the continuing legacy of colonialism and modernism, then cultural resiliency is an integral part of that continuum. Q. Rapid urbanization gives rise to unprecedented pressure on infrastructure and transport means. Which emerging/developing city according to you has tackled this challenge in a best and worst way? And why do you think so? And which developed city according to you had to go back and re-work their strategies to rising or changing needs. I think most developing cities across the world are being ravaged even as we speak by placeless transportation infrastructure. This is why a city like Curitiba, Brazil stands out. Their 1966 master plan proposed a siphoned urban growth along five structural axes radiating from the urban core, but instead of focusing their infrastructure solely on cars, they initiated a rapid bus mass transit system in the central lanes of these corridors that has now gained global attention. What is less known, however, is that the land fronting these transit corridors was simultaneously zoned for high rise buildings with residential/office uses above and retail/commercial uses at street level guaranteeing that the fabric would not only produce but also attract transit trips. Further, to incentivize the plan’s implementation, the zoning was changed to permit little to no development in downtown Curitiba, whilst promoting high-density mixed-use development along these transit axes. This strategy has not been immune to capital pressures, and the development of these corridors is a far cry from the controlled consistency seen in the best Western cities. But this synergistic transit-infrastructure-development strategy in a less-developed socio-economic context, implemented through a non-speculative and formal planning means is something many other cities should learn from. For the second part of your question, Los Angeles comes to mind. Its ongoing rail transit renaissance is actually quite ironic. Barely five decades ago, Southern California had one of the most extensive train networks in the world. But the 1,000-odd miles of rail were gradually dismantled, and circa 1963 closed in favor of an extensive freeway system. As part of Los Angeles’ renewed inclination towards walkability, mixed–use and non-utopian urbanisms, numerous policies are now not only advancing mass transit, but transit-oriented development (TOD) at all scales. Of course, compared to other American cities, this TOD rhetoric is miniscule, because the automobile still remains the convenient choice to traverse LA’s vast distances. And with conventional zoning still regulating most transit nodes, the idea of introducing density and mixed-use around train stations remains a difficult territory, with progressive developers needing to negotiate new concepts of density and livability through mainstream planning channels. But what is happening in LA is important. The efforts and struggles of this region can provide real lessons to numerous cities across the world. Q. What do you think is one of biggest challenges facing the transportation sector in various cities of the world? Why? And are there few basic measures that cities can take to improve their transport networks. In the United States, where regulation is everything, we are simply trying to reduce dependence on the automobile and repair the physical damage wrought by decades of regulated but myopically planned infrastructure designed exclusively for cars. In many other countries, one of biggest challenge is precisely reinforcement and regulation. So there are significant differences. But I think one challenge that unifies cities across the world is how to get transportation sectors to talk to other sectors of city planning (and vice versa) before implementing anything. This is something every city can actually do. If you are planning a highway, how can you simultaneously anticipate strategies for economic development, how can you rethink zoning around a new transit corridor right away – not as an after-thought as it is often done. In other words, how can transportation (and all other) sectors of a city-planning department stop working in isolation as if the others did not matter. Q. Do you think people take on the identity of the City or a City takes on the identity of people who inhabit it? Do you think the identity of the City is static or something constantly transforming and evolving? All cities are phenomena in flux. So how can the identity of a city be static? Granted, some cities change faster or more dramatically than others, but ultimately they are all events in time. The Japanese architect Toyo Ito had once remarked, “if a Western city is a museum, the Japanese city is a theater.” He was referring to the relative permanence of a European city versus a far more ephemeral city like Tokyo, where land scarcity compels constant demolition and rebuilding. Physically, Tokyo changes dramatically every few years. On the other hand, I am reminded of Venice, where in 1902, the campanile in St.Mark’s Piazza collapsed for the second time. And even as a heated debate ensued about its future, the citizens and elected officials simply decided to replicate the fallen icon, so that the visual image of the city would be the same. The socio-physical disposition of every city influences its inhabitants only as much as they influence it. The thing that interests me here is what I like to call urban immunity. Japanese citizens for instance, have since historic times lived with the idea that their cities will be destroyed from time to time and rebuilt again – this is unthinkable for many of us. When people from highly regulated cities visit less regulated ones, they react immediately to ad hoc development, unhygienic surrounds etc. But for the inhabitants of that city, it is part and parcel of daily life. The identity of a city does not stem only from icons and monuments, but equally from the deeper psychological structures and expectations of its people. Q. As a researcher and academician which is one of the most interesting Cities that you see yourself going back for your ongoing queries and seeking answers. Please elaborate. I would say Tokyo. As I write in the final chapter of my Japan book, for most non-Japanese architects and urbanists, particularly from the West, Tokyo epitomizes the extremities of contemporary urbanism. The cost of living is more than 50% higher than New York. The amount of private space per capita is 66% lower. Parks constitute merely 5% of its land surface in comparison to 30% in London. But despite these delirious densities, the amount of space actually occupied by its over-nine-million occupants on its 622-square-kilometer spread is only around 52% (though it rises up to 70% in central areas). Of course, none of these extreme numbers mean anything to most Tokyoites, for whom, the city is in fact a mosaic of discrete social worlds, urban neighborhoods, streets, destinations, efficient trains, and thousands of social places. I find Tokyo very similar to Mumbai in its pace and visual intensity, but far closer to a European city when we look at its cleanliness, order and daily efficiency. For me Tokyo is one of most livable and walkable cities in the world, even though it has evolved largely without formal planning and where one lives with the knowledge that its destruction can come at any moment. I continue to find this very intriguing because it challenges how we make, experience and live in cities, physically and mentally. Q. What is your advice to young and emerging professionals in urban design and planning around the world and what suggested readings you would recommend them to not miss in understanding the subject. Some days ago, an experienced planner put up a list of what he considers to be the 100 best books on city-making ever written. The list has all the obvious suspects and classics – from Jane Jacobs and Camillo Sitte to Andres Duany and Rem Koolhas – and attests to the vast and impressive scholarship on the subject of city-making over the past few decades. But for me, it suggests equally the shocking and dangerous Western-centric provincialism and intellectual dominance that pervades the idea of the “good city” globally – even at a time when transnational fluidity is less viscous than ever before. This is a gap that needs serious attention over the next decade by emerging professionals. We also need urbanism and planning heroes beyond European and American ones. If you think about it, most figures beyond the West that have gained a global profile have been architects, not urbanists or planners, even though they may claim to be so. They have not really been invested in the complexities of city-making as much as making great buildings. If you look at their monographs, they are really about buildings as objects or isolated projects with nothing about processes or engagements in city making. I think the agenda of urbanism has not really attained clarity or dominance beyond the West, and even for a layperson, the idea of an urbanist or city-planner remains vague at best. If the 21st century is the century of cities, then this is the biggest task at hand – to make urbanism the real agenda of our times, to prioritize urbanism before architecture, and to help citizens understand that cities are not made by architects, but by many other actors and entities. I recently had an opportunity to interact with Kevin Mark Low at 361 Degrees Conference. Kevin is a deep thinker and his approach to architecture is enthralling, this I say based on detailed, well-thought out answers to questions I posed him on behalf of World Architecture News and his talk. 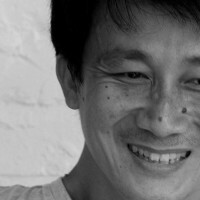 Kevin Mark Low, an architect based in Malaysia whose work has gained global recognition, left his corporate architecture job to reclaim and pursue old dreams and established his practice, smallprojects in 2002, which he runs singlehandedly. He has since lectured internationally and conducted workshops and design critiques at various universities. Q: What inspired you to be an architect? And growing up as a professional architect, whose work you looked up to? A: Many things really – my mother who taught geography, encouraged my ability to draw, without knowing that some of the worst architects in the world draw beautifully and some of the best, awfully. My father, being more taciturn, didn’t appear to bother much with what I decided, but the important thing was their both supporting the decisions I made – especially my mother and whatever she saw in me at the time, which pushed me just that bit further. Throughout architecture school and my working years, I found, I was less fascinated by architects than the specific buildings they did – over the course of my life, these were Cimitero Brion (carlo scarpa), Zimmerman House and Clooney Playhouse (Frank Lloyd Wright), Barragan House (Luis Barragan), Lunuganga and the Alfred Street house (Geoffrey Bawa), the Louvre Museum intervention (I.M. Pei), Exeter Library (Louis Kahn), the St. Louis Gateway Arch and MIT Chapel (Eero Saarinen), Casa En Valle de Bravo (Alberto Kalach), Chapel of Hope (Sigurd Lewerentz), Chapel at Ronchamp (Le Corbusier), Maison de Verre (Pierre Chareau), Commerzbank headquarters (Norman Foster) and the Cabrer house (Lacroze/Miguens/Prati). I feel that these architects built each work with a profound understanding of their specific context. Of these, the work of Frank Lloyd Wright, Luis Barragan and Geoffrey Bawa are the only three whose architecture consistently engaged the aesthetics of age in the way of time passing. Perhaps, this as yet undocumented understanding had the deepest impact on my own development. Q. You mentioned something intriguing in your talk about natural state of ways and materials in architecture and your ongoing query on why buildings can be as imperfect as us human beings? Can you elaborate on it? Global culture has become somewhat of a beast obsessed with the novelty of form. It has certainly grown past its previous romance with the spectacle of it, but the problem still remains that if the form of a work fails to excite or stimulate and present formal experiences in some fresh way, it warrants less attention. And a great part of this zeitgeist is driven by the immediacy, the instantaneous nature of the Internet – nothing is new or fresh if it is posted a day later. As such, we have evolved an architecture of the photoshoot, of work that has to be imaged as soon and as quickly as it is completed, an architecture intended to be experienced in completeness from the first day it is inhabited. For the work I do, it is not possible for me to think of architecture as ever complete with the completion of the contract – with something as dynamic, unpredictable, and human as architecture, as architects I believe we can only ever begin what time alone can complete. Link to the full interview is here. To understand architecture, it is important to understand forces that define and shape them. Contemporary and modern architecture of today was evolved from historical style which no longer could serve the changing times brought on by massive human movement across geographies and onset of industrialization. 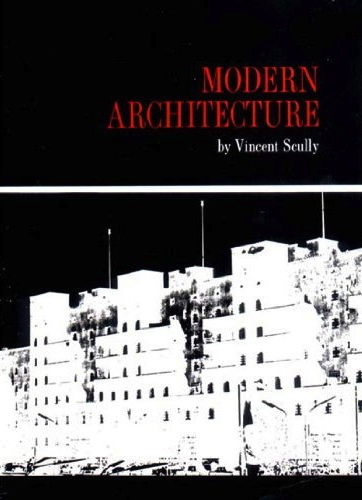 Modern Architecture by Professor Vincent Scully works as a thoughtful primer towards understanding what we have come to inhabit. He looks at the metaphysical force as well that humanity has never tried to explore fully quite like the modern times. Expression through architecture also encompasses this, this overthrowing of stabilities of thinking, of communities and settlements. In all these ways, the old stabilities have been overset, and human beings, in the mass have been given an architectural environment which is an image of modern world itself, in which they do not know exactly who or where they are. He has therefore vacillated between a frantic desire to find something comprehensible to belong to and an equally consuming passion to express his own individuality and to act on his own. He has become at once a tiny atom in a vast sea of humanity and an individual who recognizes himself as being utterly alone. And thus, modern architecture has embedded these tensions of belonging and unbelonging at the same time and pursuit, the quest of anchoring and exploring, both at one time. Quest to find answers where have we come from and where are we going and how to express stable architecture in this impermanent state of mind. And since, of all the cultural divisions of Western civilization, America was the one to which the future seemed most open and in which the sense of actual uprootedness was most strong, it was in America that the polarities were first swept away in terms of a new, continuous architecture order. Another extract from Naipaul’s India: A Million Mutinies Now. Indian architecture through his eyes. But the years race on; new ways of feeling and looking can come to one. Indians have been building in free India for 40 years, and what has been put up in that time makes it easier to look at what went before. In free India, Indians have built like people without a tradition; they have for the most part done mechanical, surface imitations of the international style. What is not easy to understand is that unlike British, Indians have not really built for the Indian climate. They have been too obsessed with imitating the modern; and much of what has been done in this way- the dull, four square towers of Bombay, packed far too close together, the concrete nonentity of Lucknow and Madras and the residential colonies of New Delhi- can only make hard tropical lives harder and hotter. Far from extending people’s idea of beauty and grandeur and human possibility- uplifting ideas which very poor people may need more than rich people- much of the architecture of free India has become part of the ugliness and crowd and increasing physical oppression of India. Bad architecture in a poor tropical city is more than an aesthetic matter. It spoils people’s day-to-day lives; it wears down their nerves; it generates rages that can flow into many different channels. 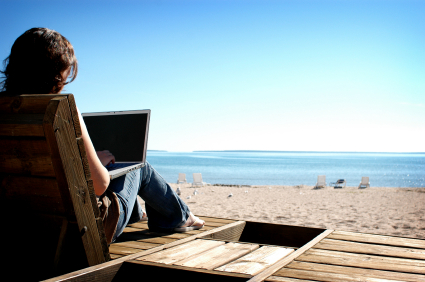 Exploration of modern workplace from what it has been and where is it going, or is it really going anywhere? This post appeared on World Architecture News Mumbai metro blog. My recent visit to Leopold Café at Colaba Causeway brought back a few uncomfortable memories from the past; of that fateful day when Mumbai was seized and attacked by terrorists. It was 26 November 2008, which was soon labelled as 26/11 under the burden of sensationalism by the earnest media where one’s own identity is seen through the western lens even in times of tragedy. The American branding had become more essential to the media than the gruesome events that unfolded. I sat in the café, sipping my iced tea and reminiscing about the good old college days of being broke and still trying new hang-outs. Soon, I was consumed by the memories of the past when Leopold café was attacked leaving 10 people dead right here. It has been 3 years and it made me wonder looking at those bullet marks in the walls, if, with time, we ourselves blur our wounds or wounds themselves dissolve. And how much of it matters of physical traces in built spaces. 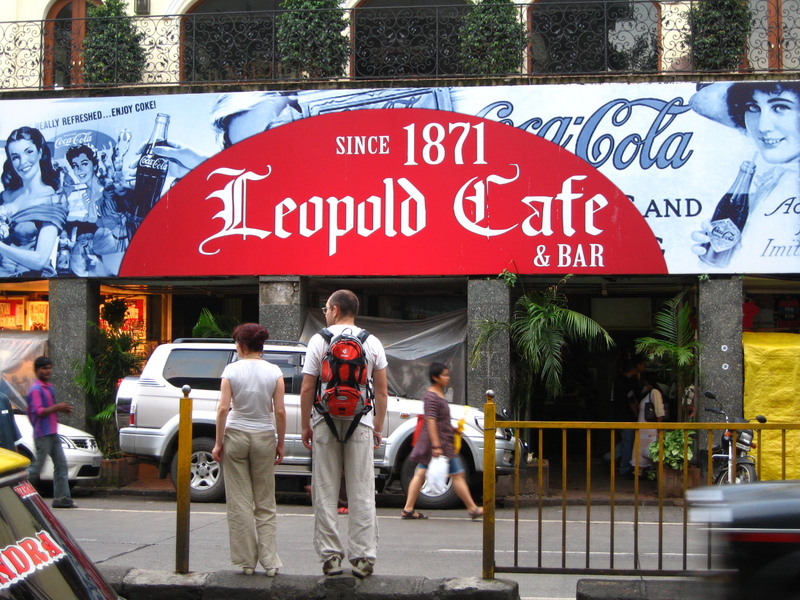 Leopold Café reopened shortly after the destructive night of the attack. Owners Fahrang & Farzad Jehani defiantly had stated: “We would never let terrorists win.” The first customer after the reopening ordered a pint of beer for himself and a Coke for his six-year-old son, and said Leopold’s reopening was a sign ‘Bombay is getting back to normal’. By maintaining those bullet marks on the walls, the owners have attempted to retain that part of the history and curiously many visitors and foreign tourists take a tour and document it through images. In that sense, it may be a continuous reminder of the past. 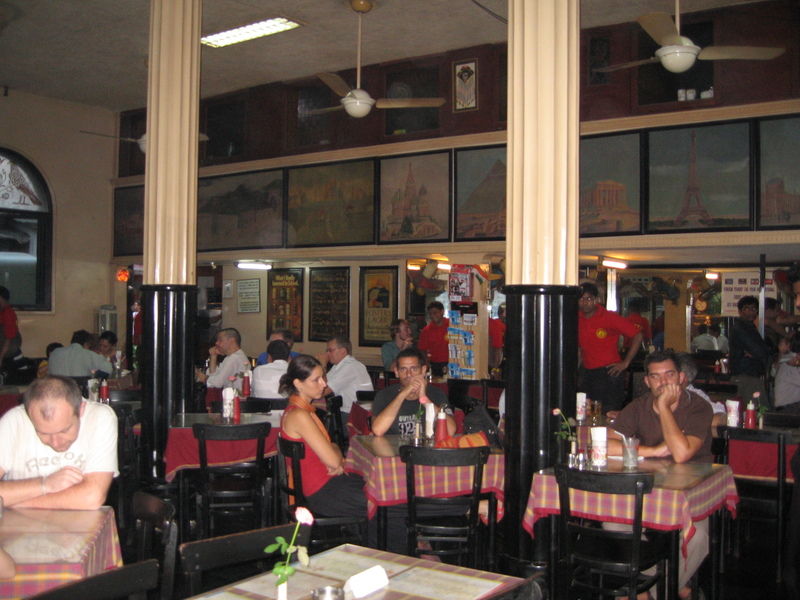 The Café stills reeks every bit of its colonial belonging from inside and out. Fluted columns, old cream-coloured slow-whirring fans, dark brown partially worn out furniture, arched windows and semi-wood panelling on the upper walls. Its clientele has always been a good mix of foreign tourists, college students and street shoppers. It is always buzzing with activities, is almost never empty and has retained the influx of people to same extent as before the attacks took place. Workplace environment is going through an interesting transformation and it is being accelerated more than ever due to changing fabric of work itself. There is an evident paradigm shift from knowledge workers of Industrial age model to insight workers of Information age model. This is changing and will continue to change the way we work and perceive our work model and effectively leading to how it will affect our physical workplace environment. Global recession has triggered this change and pushed people out of their comfort zone to look at their business model more critically and technology is enabling them to explore alternative different ways to do business. We are connected in so many ways and information flow and access is not hierarchical anymore instead it is multi-layered, multi-directional and more accessible. Moreover, in a heavily globalized environment, access to expertise and skills has become easier. With those kind of dynamic forces, it is critical to look at workplace strategies which consider predictability and unpredictability and build them into the very fabric of corporate culture. And at a minimum keep a leeway for businesses to transform and flourish with changing scenarios to address and accommodate its needs. Needs not just that are most visible, direct and current but also take into account factors of uncertainty, bundled altogether with the original vision of their business. In a hetero-cultural work conditions, it is essential that it is one that takes into account the various value system, the work force might come with. Values by its very nature are dynamic, eroding, erasing and many a times modified subconsciously with exposure. With that taken in account, how does work environment provide conditions that will optimize capabilities of workers? In Indian context, there is a first wave of physically highly upgraded workplaces being provided which are more or less a replica of offices and solutions being provided elsewhere in the world. So, office in China and London of the same global corp is being repeated in India as well. Although, conditions and local forces of each location cannot be more different. Indians are just about getting ready to embrace a heavy corporate work culture while the same has shown visible cracks in it already in the West. It could be a sincere intentional mistake to repeat the same model to only realize that it will fumble in Indian conditions as well like it did elsewhere. The notion of India Inc. is a fabricated, make-belief concept by handful few. The race to imitate nations and societies that are considered more wealthy and successful could be a devised Indian folly well underway. Symbolic successes achieved through gleaming buildings and advanced infrastructure may mean not more than creating a sense of temporal false euphoria. Enduring spaces and built environment are hard to come by and its almost never a product of cookie-cutter industrial output model or by merely replicating entity out of context. Change is messy and transformation non-linear. It almost never falls into a neat linear timeline and the process sometimes takes you out of your comfort zone, thrashes you, flogs you in several directions before you can define and redefine identity of an entity, self, place, people, cluster and societal aspiration. 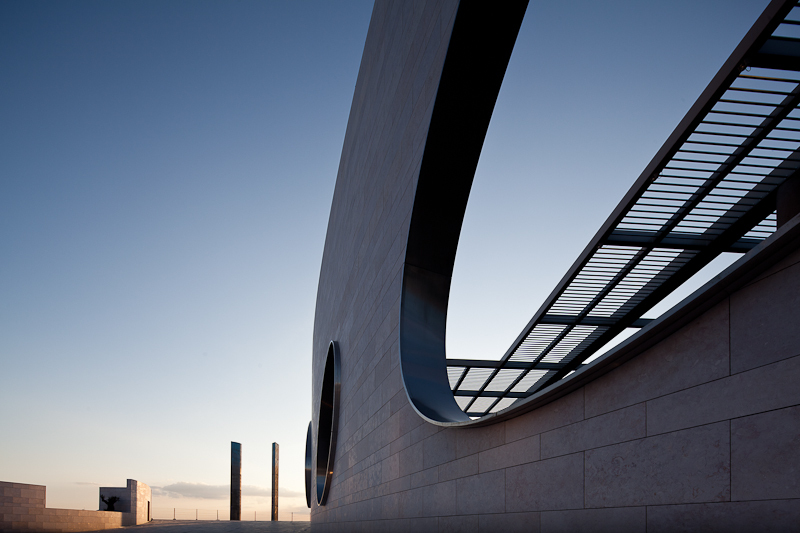 Champalimaud Centre for the Unknown designed by Charles Correa Associates is the new research and diagnostic center located in Lisbon. It is state-of-the-art facility for some of the best scientists who will be researching on diseases like cancer, dementia and blindness. John Thackara of Doors of Perception book named In the Bubble: Designing in a Complex World is the book which I cherished page by page as it unfolded various design challenges, questioned my perception and provoked me to think deeply as a designer who would claim to design part of spaces, built environment in tomorrow’s world. Book does not provide any packaged solutions but it did not claim to do so ever. It provides a perspective, a different one and perhaps a little more and challenges all of us in this system to critically understand where we are in terms of time and technology from where we were few decades ago and how all this will impact the design world of future. I believe that a desirable future depends on our deliberately choosing life of action, over a life of consumption. Urban planners need to pay as much attention to social networks as soft infrastructure as they do now to the hard infrastructure of roads and railways. After the initial exuberance its now clear that wireless communication networks are an additional layer of infrastructure- not a replacement of the physical city. He talks fair amount of what resulted through industrialized model of education and enforced standardized testing of skills that have come to fail, even to a current system. There is a kind of mismatch between the kind of learning prescribed by these enlightened experts and what many employers perceive to their short-term needs. As a result, of this mismatch, the school to work transition has become increasingly difficult phase, and many employers now take their own training measures. They tend to be heavy on applied skills- light on metacognitive ones. We might reject the narrow focus of much corporate education but its partly our own fault as a society. We have filled our world with such unstable technology and clunky systems; these need to be looked after by people with limited horizons who do what they are told and don’t ask too many questions. Call centers- to name just one of among a thousand support functions in our technological culture- don’t recruit people with metacognitive skills who look at the bigger picture. They need drones. Stuck inside organizations that perpetuate divisions between domains and that isolate knowledge from the context in which it is to be used, we become less competent at tackling complex and multidimensional social questions. If our connections to the edge are inadequate, we find it hard to figure out what people really need and end up pushing products that they don’t. What we have now come to appreciate is that the more diverse an ecological system is- be it a swamp or a city, the richer it is. Sprawling monocultural suburbs, multilane highways, golf courses, airports and the like are impoverished contexts. Our speed culture fosters particularly barren contexts. Very large grids, very big global hubs and the massive flows of people and matter in between them are functional but not nourishing. That is why application of ‘high-concept’ design to contexts we barely understand is irresponsible and probably counterproductive. Trust accrues through time and is built during encounter and interaction between people; it cannot be digitized and it cannot be rushed. And thus spaces designed mechanically ignoring the subtle sensitivities of human nature and interactions miss their expansive fertile nature of minds which inhabit them. And much of these office designs still continue to deal with interrelated aspects of materials, flow, adjacency, digital artifacts and much more of digital facilitation of work but puts human beings not as front runners but as a backdrop. So the prime intention becomes a useful backdrop but not the prime subject to be built from or around. This book opens multiple opportunity of dialogues and triggers you to think carefully as designers and consumers to things and services that we make use of and how it alters our relationship and behavior and system as a whole. It nudges you to be careful and sensitive in our everyday choices, be cognizant of patterns as consumers to passive participatory witnesses and consumers of events and how it all might impact this system as a whole.